A drug used to treat advanced breast cancer has had what appears to be unprecedented success in prolonging lives in a clinical trial. Patients who received the drug, Perjeta, had a median survival time nearly 16 months longer than those in the control group. That is the longest amount of time for a drug used as an initial treatment for metastatic breast cancer, and it may be one of the longest for the treatment of any cancer. Most cancer drugs prolong survival in patients with metastatic disease for a few months at most. The results were being presented on Sunday in Madrid at the annual meeting of the European Society for Medical Oncology. Perjeta appears to greatly prolong lives in a clinical trial. 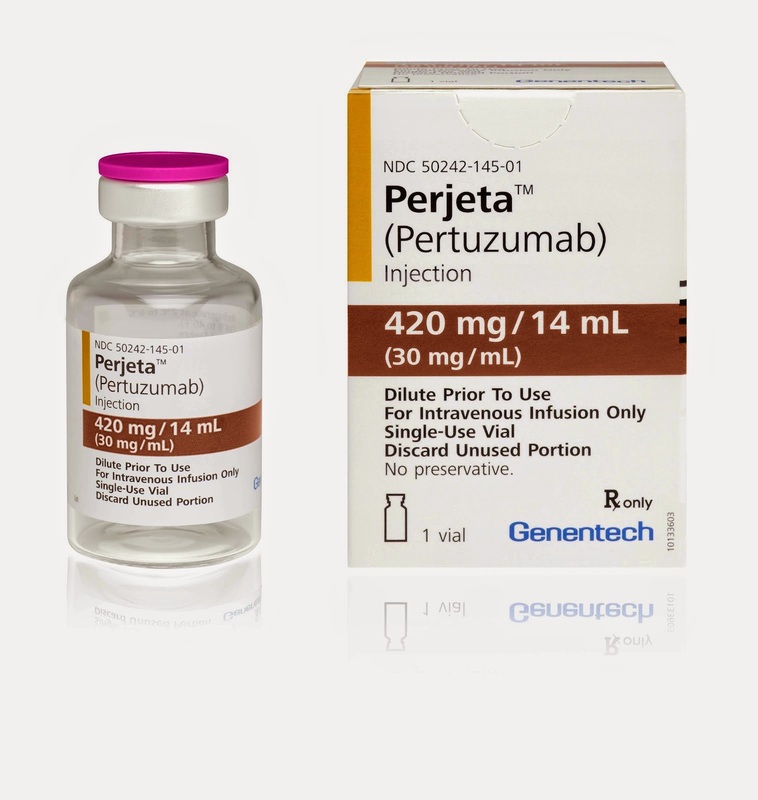 Previous analyses of the clinical trial established that Perjeta, known generically as pertuzumab, increased survival by a statistically significant amount. But until now it was not known by how much, because patients had not been followed long enough. 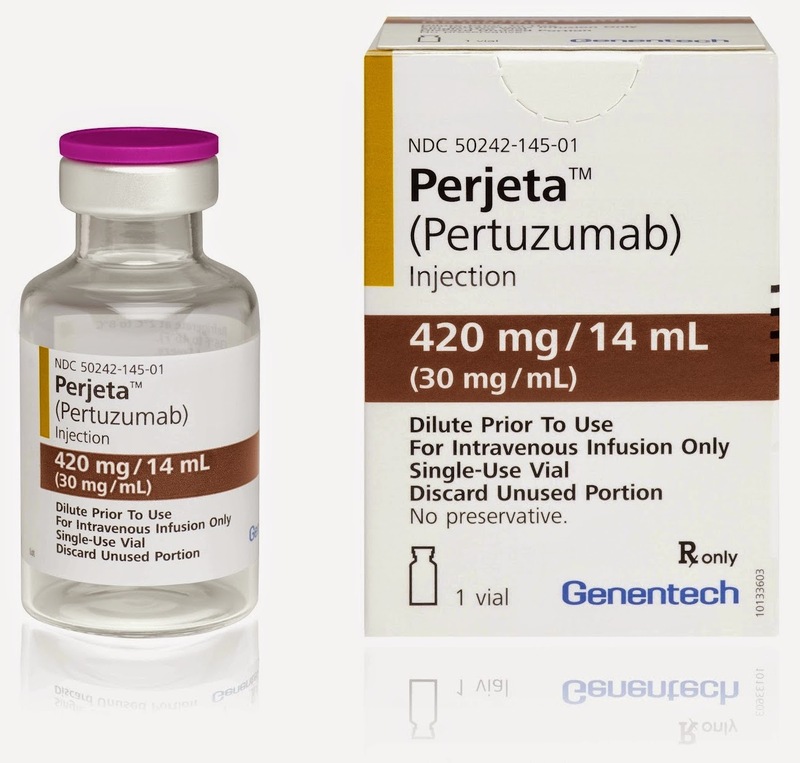 Perjeta, like the better-known Roche drug Herceptin, or trastuzumab, blocks the action of a protein called HER2, which spurs the growth of some breast tumors. Perjeta is meant to be used with Herceptin for the roughly 20 percent of breast cancers characterized by an abundance of HER2. Perjeta was approved by the Food and Drug Administration in 2012 and is already considered the standard of care in the United States. Still, the results could lead to increased use of the drug. Only about half of the eligible women are being treated with the drug in the United States. And doctors say use is lower in many countries where cost is more of an issue. In the United States, Perjeta costs about $5,900 a month and Herceptin about $5,300 a month. Perjeta was priced lower than some other new cancer medicines because it has to be used with Herceptin. Some recently approved cancer drugs cost more than $10,000 a month. Roche reported Perjeta sales of 388 million Swiss francs, or about $408 million, in the first half of this year, with about $250 million of that coming from the United States. The trial, sponsored by Roche, involved 808 patients around the world with previously untreated HER2-positive metastatic breast cancer. Half of them received Perjeta, Herceptin and the chemotherapy drug docetaxel. The other half received Herceptin, docetaxel and a placebo in place of Perjeta. The median survival time for those who received Perjeta was 56.5 months, or about four and a half years, compared with 40.8 months for those in the control group, a difference of 15.7 months. By another measure, known as the hazard ratio, use of Perjeta reduced the risk of dying 32 percent. Use of Perjeta delayed the progression or worsening of the cancer only about six months in the trial. Experts said it was not clear why the drug extended lives so much longer than that.